Today is Mother's Day, and the theme at I Heart Faces is "Celebrating Mom". How perfect. When I knew this theme was coming I was trying to decide what kind of photo to submit. I wanted to capture an image of my mother that was true to her. There are many things that remind me of my mother. One of the first things that come to mind when I think of her is of course good food! If you ever read this blog you know how I feel about her cooking skills. The second thing that comes to mind is fresh cut grass. My parents have a rather large yard, and my mom always keeps it beautiful. Even at the age of 76 she is still push mowing the lawn when necessary, and she usually mows at least twice a week. It's her thing, and she loves it. I remember when I was young how much it drove me crazy that throughout the summer she would get up and mow the lawn at 7 am right underneath my open window. Ugh! Nothing like waking up early all summer long to either the vacuum or the lawn mower, but now that I'm older I appreciate her hard work, dedication, and discipline. Another thing that immediately comes to my mind is sheets hanging on the line. I remember how much I loved crawling into my bed after she had washed them and hung them outside in the warm summer sun, and also how much I enjoyed listening to them whipping in the wind while I played outside. They smelled so good, and were oh so soft. That was and still is my mom. Always working. From chopping wood for the winter, to tilling and weeding the garden, her work is year round and it is hard. She is tough though, and I love her for that. There is one other thing that always makes me think of mom, and that is seeing a crochet hook. Another thing that she is the master at. She can make a baby blanket in a matter of days, and a hat or scarf in just a few hours. Recently she has been teaching Seej how to crochet as well. What a great gift for a grandma to pass on to an eager child who wants so much to be just like her. I felt that this was the image opportunity I was looking for to portray the "Celebrating Mom" theme. I love that this gift she has will live on through my daughter, and that many of her other gifts have been passed on to my children as well. I do love her and all that she does for me. I couldn't accomplish nearly as much in my life without her. This goes for my mother-in-law too. I am so lucky to be able to learn from these women. Although this image isn't perfect, it is one that both Seej and I will cherish for many years. Happy Mother's Day! What a great post! I love her too, and thankfully I got some of those things from her as well!!! I love that pic, it is precious. Happy Mother's Day! Hope you had a great one! 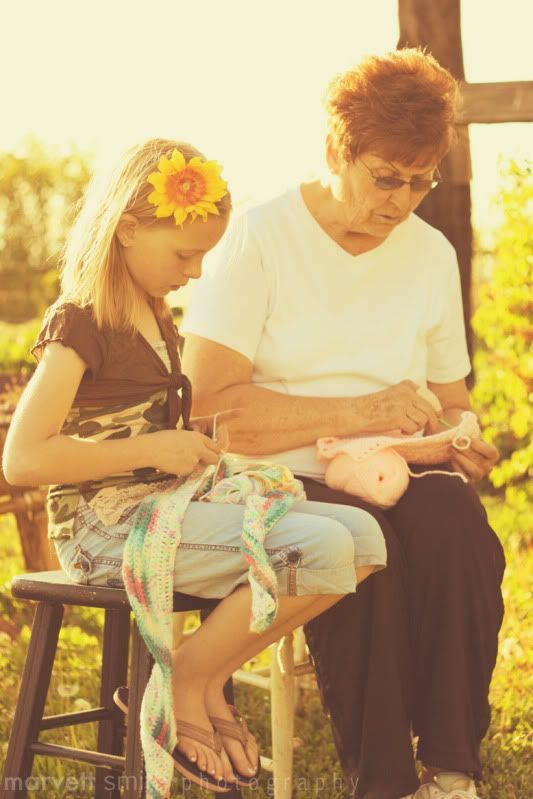 I love everything about this photo --the sweet image, the edit, the flower in your daughter's hair, how they're sitting quietly side by side, crocheting in the sun... Precious! What a wonderful image. Truly one to cherish. I love that your mom is spending the time to teach your daughter something that she loves. Great shot. I love the editing too. Just sweet, great shot of such a perfect moment! I love it. Absolutely beautiful. Oh, this is really special! I would love to have a shot like this with my own Grandmother. Moments like these are fleeting, awesome that you captured it. A sweet moment and lovely light! You did a really great job! I love this picture. You captured your Mother so beautifully. I love the sunlight. And your daughter. Precious! Love the light! Sweet photo, and sweet moment!! These are the moments that are remember forever! Beautiful!!! It's great that you have so many wonderful and vivid memories of your Mom. I hope our kids have the same memories of us when they grow up! Beautiful photo again, Marvett! This is such a neat moment caught! This picture is priceless! Oh my gosh - this is absolutely precious!! I love the moment you've captured!! LOVE this! The expressions, the sunlight... great job!! Goregous! Love the lighting, the processing....the moment. so beautiful, adorable, and meaningful!